Tsarchen Losal Gyatso (Tib. ཚར་ཆེན་བློ་གསལ་རྒྱ་མཚོ་, Wyl. 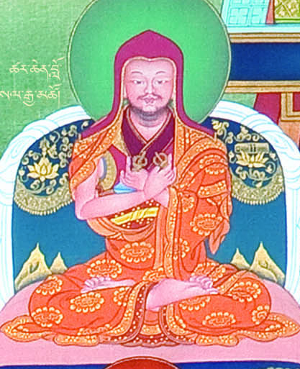 tshar chen blo gsal rgya mtsho) (1502-1566) — the founder of the Tsar subschool of the Sakya tradition and of its main monastery, Dar Drangmoche Monastery (Tib. འདར་གྲང་མོ་ཆེ་, Wyl. 'dar grang mo che) in the province of Tsang. A number of his writings survive such as his compositions on the Hevajra visualization (Tib. ཉི་མའི་འོད་ཟེར, Wyl. nyi ma'i 'od zer) and on the Vajrayogini teachings. His biography was written by the Fifth Dalai Lama. His chief disciples were Jamyang Khyentse Wangchuk, who is compared to the sun, and Mangtö Ludrup Gyatso, who is likened to the moon, as well as Yol Khenchen Shyönnu Lodrö, the Third Dalai Lama Sonam Gyatso, and Bokarwa Maitri Döndrup Gyaltsen. This page was last edited on 19 September 2018, at 00:17.